I write to inform you of all the painful events that happened in our here at CCM since last night. Our Bishop Wens, died yesterday evening at around 7.00pm probably by heart attack. The body was found bended over his desk where he was writing something, by sr. Michel who was coming to his office to call him for dinner. The sister alerted me (I had just left CCM for my community at 6.00pm), some CICM fathers, Boya, Oyuna and others. A heart stimulation was applied and when the ambulance arrived they had found our Bishop already dead. Soon after the police was alerted together with legal doctor. All came to make all the enquiries indicated by the law. At 10,15 at night the body was taken to the forensic hospital for examination. The law prescribes that when a foreign person dies in Mongolia, an autopsy exam should be performed. This morning (26 September) accompanied by Oyungerel, Lucy Oidov and fr. Ronald, we went to the police office to require that the autopsy my not be performed on the body of the Bishop, the permission was granted. Lately our Bishop was a bit showing signs of being a bit tired but nothing could show that his heart was so sick. At around 10,20 a meeting of Superiors of religious communities and parish priests was held in CCM to organize what it should be done in this occasion. The funerals will be held on Sunday 14th of October in the Cathedral and details of it will be given later. The date was chosen to allow people from abroad to come. During these days CCM will be the place were to go to honor and pray for our bishop until the body will be transfer from the Hospital to the Cathedral. Every day in the evening, at 7.00pm, at CCM IV floor, there will be a mass celebrated in memory of our Bishop until the day of the funeral in the Cathedral. 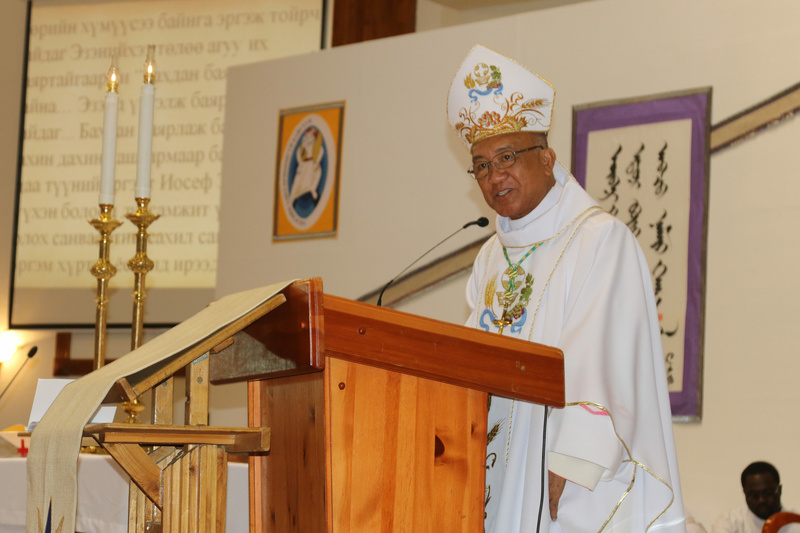 Photos of Bishop Wens are available at the catechetical office for parishes, religious communities and social centers. Let us all be more united in prayer for our beloved Bishop Wens the founder and pastor of this church.